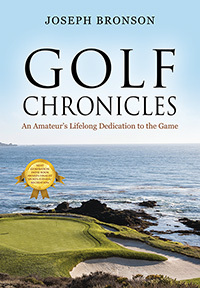 Joseph Bronson’s “Golf Chronicles.” From Pebble Beach to St. Andrews, celebrate amateur golf from the perspective of an ordinary player who simply loves the game. Joe Bronson has played golf for the past 40 years at courses all over the world. Find out about his insights, about the most enjoyable holes he has played – and the hardest. His passion for the game shines through in his entertaining yet informative collection.